Nastya, 15, started to skateboard in April. 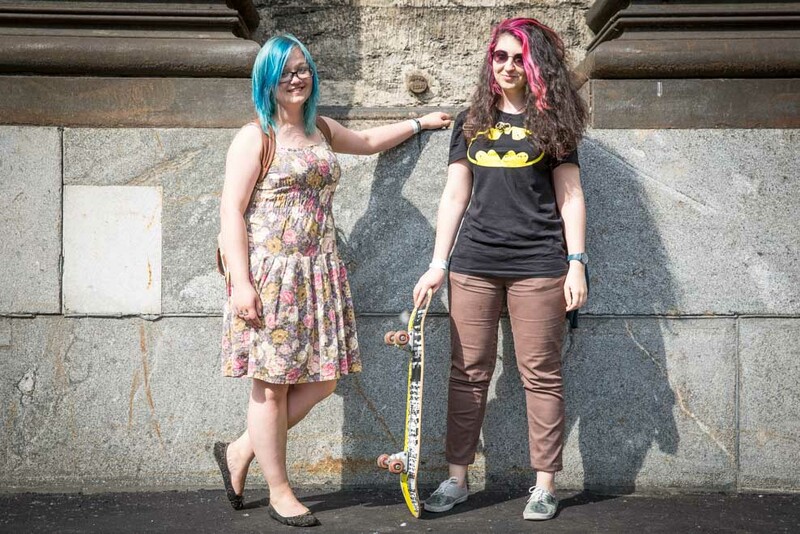 Katya, 14, was sitting with her long board in the Moscow metro. She said she first stepped on a skateboard when she was five. Dzhennet, 18, said girls are taking up skateboarding to meet boys. Olga, 26, was practicing to ride a skateboard with her boyfriend for the first time. The couple had just bought the board that day. Olga said they would normally come to the park with just one foot scooter between them, so they decided to buy a board so that each of them would be able to ride something. They plan to switch, so that each gets to practice. Lika and Lera were both wearing panama hats while carrying their skateboards along Nevsky Prospect. Nastya, 21, a student from Kazan, started stake boarding a year ago. Alisa, 25 and a stylist, said she tried skateboarding for the first time about 10 years ago. However, she recently took it up again because she wants ”needs some outdoor exercise” and biking is not her thing. Alisa said more girls are skateboarding today partially because its a fashion trend, but also because skateboards have become more accessible, both in terms of price and variety. A young Russian girl skating on a long board with a NY sweater in front of the Hermitage. Katya, 19, was skating toward VDNKh Park. Nastya, 16 and Polina, 16, traveled to Moscow from Lubertsi, a suburban town, to ride in Gorky Park and along the Moscow River. They say their are few places to comfortably skate in their suburban town. Olga, 18, was practicing skateboarding at Gorky Park. An advertisement student, she said she likes extreme sports. Attempts by her parents and boyfriend to talk her out of getting a skateboard didn’t work. She said she fell only once on her first day on the board. The was either her fifth or sixth day on her board, she said. Daria, 17, was skateboarding on Palace Square at sunset. She said she started skating in 2014. 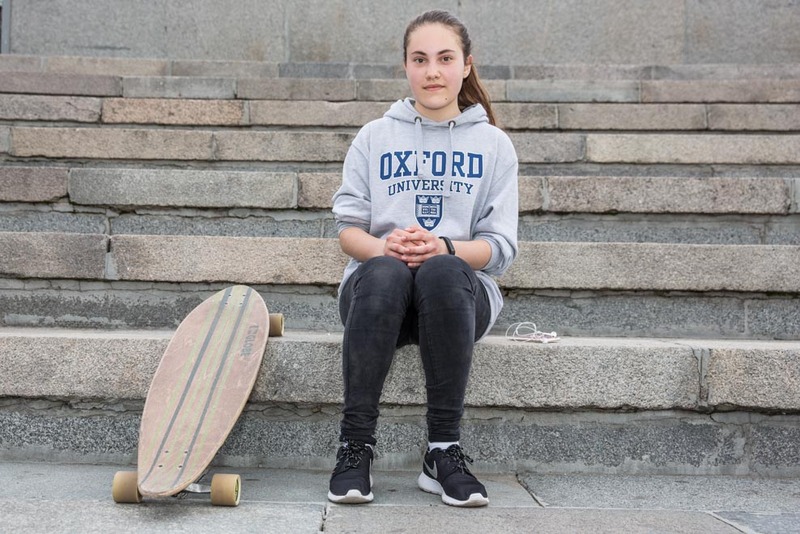 Lina, 17, said her parents gave her a skateboard for her birthday so that she would spend more time on the streets and a little less time studying. A Muscovite, Lina has been studying at a boarding school near London for the past three years. She was practicing in Gorky Park. Sophia, 14, and Sasha, 15, were practicing at Gorky Park, where there is a section to practice tricks. 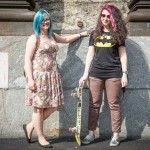 Serafima and Katya, 24, in St. Petersburg with their new skate board. Serafima grew up in Kamchatka and Katya in Rostov. Rita and Maria, 18, at Vorobyovskaya Naberezhnaya with their boards. Maria (right) has been skateboarding for two years while Rita took it up in May to keep her friend company. The schoolmates will attend different universities in the fall. Svetlana, 20, was teaching her younger sister Christina, 8, to skate at Gorky Park. Sonya, 15, and Liza, 14, at Vorobyovskaya Naberezhnaya with their boards. 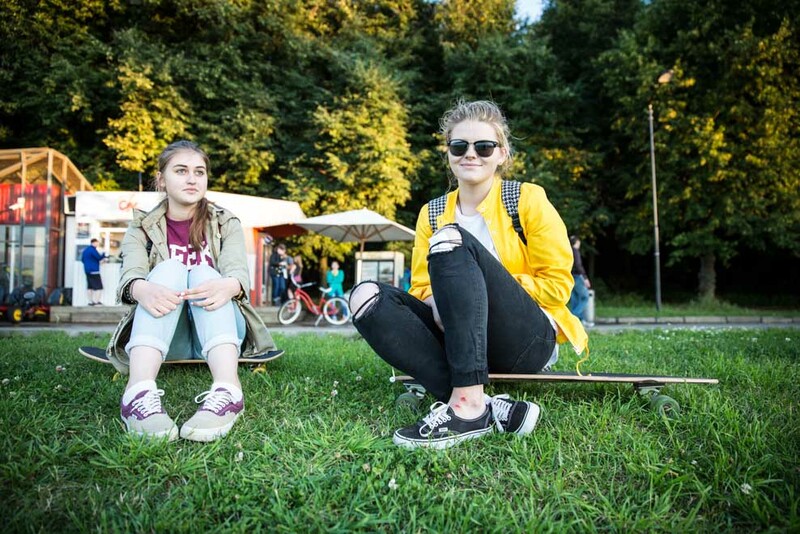 Dasha, 17, and Anna, 15, started to skateboard in May, 2015. They were headed to Sparrow Hills embankment near Moscow State University. They also skate at VDNKh Park. Girls resting near the Gorky Park skating area with their longboard. Nastya, 19, started skateboarding in May, two weeks before this photo was taken. She said she is a Master of Sports candidate in skiing and skateboarding is good summer practice for her.